How does WE Travel get such great accommodation rates? As a meeting / conference planner, I have built relationships with many hotels, would WE Travel honour those relationships? How does your tendering system work? Are there contractual obligations with WE Travel? We are looking for travel agency support because conference delegates have complained in the past about paying drastically different rates for hotel and airfare, can you help us get comparable rates for all our attendees? We need more rooms than we thought, can you get us more rooms at the same rate? How can you ensure our members book according to our travel policy? Is there any advantage for our delegates to book flights with you rather than booking directly with Air Canada? Doesn’t your service just contract out union jobs? Can delegates make changes to their flights? How much advance notice do you need to make delegate travel bookings? As a traveller, is there any advantage to me to book my flight with you rather than booking directly with Air Canada? How much advance notice do you need to make my travel bookings? Can you match seat sale prices? Can I book my holiday travel with you, or are you just for union meetings and conferences? Can you book a ticket for me using my Aeroplan points? How do I get my tickets and reservation confirmations? How early do I have to check in for my flight? The union is paying for my travel, why do you need my credit card to book a hotel? Do I have contractual obligations to book with WE Travel? How does WE Travel get such great accommodation rates? We tender room bookings of 10 or more to multiple hotels, ensuring that they match your travel policy and member needs. In 2008, WE Travel contracted over 86,000 room nights across Canada on behalf of the unions and negotiated $240,000 in cost savings and other benefits by being able to represent the larger brother and sisterhood of Canadian unions. As a meeting / conference planner, I have built relationships with many hotels, would WE Travel honour those relationships? Absolutely. If you like, we can send tenders to your favoured hotels, and to some you may not be familiar with, so that you can be assured that you are getting the best possible service and value. We understand that relationships are golden, so you can always opt to go with a hotel for relationship reasons. It is ultimately up to you to choose where you book. And we may even be able to negotiate a better deal with your favoured hotel, which would help you maintain your relationship and bring down your costs. How does your tendering system work? We send no-obligation tenders out for bookings of 10 rooms or more. WE Travel will tender from unionized, wheelchair accessible facilities in an anonymous manner unless directed otherwise by the client. Once, the client has decided on the top 3 choices, WE Travel will work through pricing with the prospective venues to obtain the best deal possible. Once you have made your final decision on the venue, we will send out a contract for you and the venue to seal the deal. Are there contractual obligations with WE Travel? We do not put a formal contract together for clients, so there is no pressure to use, or continue to use our services. We will even send a no-obligation tender out for a new client to show you the value of our services. We are looking for travel agency support because conference delegates have complained in the past about paying drastically different rates for hotel and airfare, can you help us get comparable rates for all our attendees? Yes. It is our mission to ensure that clients who are booked into the same hotel within days of each other are paying similar rates. Our tendering, block-purchases, and solid relationships with travel providers help to ensure comparable rates. We need more rooms than we thought, can you get us more rooms at the same rate? WE Travel will liaise with the hotel if additional rooms are required or we will source out new venue options for overflow accommodation. What are your fees? All of our fees are laid out here. Tendering, negotiating and contracting block accommodation bookings – No Fee is charged to our clients. We negotiate a 10% commission into the accommodation contract, which is paid by the venue. Meeting & Convention Planning – No Fee for contract negotiation, housing services and web design. On-line Registration and Delegate Fee Collection – Negotiable. The fee for this service is negotiated on a case-by-case basis but you can estimate 10% of the expected registration charges. Note: this pricing is subject to change without notice. How can you ensure our members book according to our travel policy? We keep your travel policy on file, and every time a member contacts us to book travel we pull up the policy. Examples of travel policies we enforce are: travel can be charged to the corporate credit card by authorized personnel only, travel can be booked by any member but must be direct billed to that member, flight, car and room classes can be specified, no travel on statutory holidays, etc. And you can carefully monitor all travel using our monthly reports, which detail costs, dates, locations, service providers, reasons for travel and any other information you require us to collect from your members. Is there any advantage for our delegates to book flights with you rather than booking directly with Air Canada? Yes, there are a few. We keep client profiles on all out travel clients, so once they have booked with us once, we know their travel preferences: seat selection, type of fare, special requests, frequent flier memberships and numbers, etc. We can ensure that their flight is just the way they like it. We also maintain hotel and car rental preferences so it is very easy for us to take care of all their travel needs with one simple call. Because we are a full service travel agency, if your delegates need anything on their trip, or if there are any problems with their flight, we can help get the troubles resolved. Doesn’t your service just contract out union jobs? Absolutely not. WE Travel staff are CUPE members. Unionized staff (in the hotels and airlines) still take your reservations. You make the decisions and manage your members’ travel. Our team doesn’t take work away from anyone, we are here to negotiate on behalf of our brothers and sisters, and to support travellers, and meeting and conference planners with specialized travel services. Is there any advantage for our delegates to book flights with you rather than booking directly with Air Canada? Often yes, but this will depend on the rules of the original fare purchased and the availability of an alternative flight. WE Travel does not charge a change fee however, Air Canada and other travel providers often do. Airline change fees range in price from $50.00 to $150.00, and they will have to pay any fare difference on the new flight. How much advance notice do you need to make delegate travel bookings? Flights, car rental and hotels can be booked same day. All confirmations can be emailed that day. Though we can help you establish systems (online booking and registrations options) that encourage delegates to make their bookings early, which makes your job of planning much less stressful! As us how. As a traveller, is there any advantage to me to book my flight with you rather than booking directly with Air Canada? Yes, there are a few. We keep client profiles on all out travel clients, so once you have booked with us once, we know your travel preferences: seat selection, type of fare, special requests, frequent flier memberships and numbers, etc. We can ensure that your flight is just the way you like it. We also maintain your hotel and car rental preferences so it is very easy for us to take care of all your travel needs with one simple call. Because we are a full service travel agency, if you need anything on your trip, or if there are any problems with your flight, we can help get your troubles resolved. How much advance notice do you need to make my travel bookings? Flights, car rental and hotels can be booked same day. All confirmations can be emailed to you that day. Can I make changes to my flight? Often yes, but this will depend on the rules of the original fare purchased and the availability of an alternative flight. WE Travel does not charge a change fee however, Air Canada and other travel providers often do. Airline change fees range in price from $50.00 to $150.00, and you will have to pay any fare difference on the new flight. Can you match seat sale prices? If there is a seat sale on when you book, pending seat availability, we can get you that fare. We are not given advance notice as to when the next sale will come out, but Air Canada has now added a 24 hour best price guarantee in case a better fare comes out the day after you book. Keep in mind that waiting for a seat sale can be risky. You can’t take advantage of lower fares if the flight you need is already sold out! WE Travel will work to get you the best fare – on the flight you need. Can I book my holiday travel with you, or are you just for union meetings and conferences? We would be happy to book your leisure travel, as well as your union business travel. Ask our travel agents about the great deals we can offer you on union-friendly package holidays. Can you book a ticket for me using my Aeroplan points? Yes. You will need to add a WE Travel agent to your Aeroplan account, but once you have done that once, we can make your Aeroplan bookings for you at any time. And yes, you can accrue Aeroplan points on your fare-paid flights, just make sure you provide us with your Aeroplan account number when we set up your profile. To enrol in Aeroplan go to www.aeroplan.com or call 1-800-361-5373, and enrol with your name as it appears on your driver’s license or your passport. How do I get my tickets and reservation confirmations? You will receive two emails from us: an itinerary and an electronic ticket / reservation under separate cover. For flights within Canada, on Air Canada, check in one hour prior to departure. For international flights, confirm the time with the agent when you book, or check the airline’s website. As a rule we recommend allowing a minimum of 2 hrs for check in and security clearance. 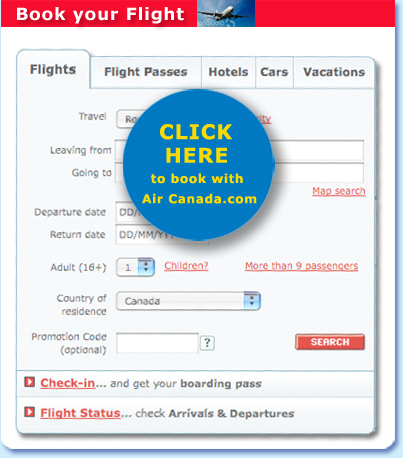 You can speed up the process by going to www.aircanada.com up to 24 hours prior to departure. You can check in on the web and print your boarding pass. The hotel requires your credit card to hold the room for you, it is called a “guarantee”. If you do not show up for the reservation, they will charge you for the night. It is important to note the cancellation policy with the hotel, as it varies from up to 6:00pm the day of arrival to up to 48 hours prior to arrival. If you have reserved a room, and need to cancel, a WE Travel agent can help you, or you can call the hotel directly to cancel your reservation. Do I have contractual obligations to book with WE Travel? We do not put a formal contract together for our union clients or for individual travellers, so there is no pressure to use or continue to use our services. Though we hope you will continue to choose us, and we will work hard to earn your repeat business.